When Cliff Ensor bought Villa Paula in 1974, the house was in a grave state of disrepair. Vandals had shot out the beautiful stained-glass windows, graffiti was scrawled across the stucco walls outside, and the county was ready to order its demolition. Not to mention, the ghost of a one-legged Cuban woman frequented its hallways. The exquisitely designed house at 5811 N. Miami Ave. in Little Haiti catches your eye as you drive past. It sits among ramshackle homes and overcrowded two-story apartment blocks like a misplaced masterpiece. By the time you turn your head to get a good look, though, it’s too late. The adrenaline-charged traffic spurs you past it and you barely manage a glimpse of the whitewashed, neoclassical gem. When the home was built in 1926 to house the Cuban consulate to Miami, things were a little different. The neighborhood was still mostly agricultural and the home’s first occupants likely sipped coffee on the white-columned front porch in rural tranquility. All the building materials for the mansion, and the workers who built it, were imported from Cuba. Ten rooms, two baths, 18-foot-high ceilings, elegantly hand-painted floor tiles, and Tuscan columns are just some of the features Havana architect C. Freira included in the home. Almost six decades later, in 1983, the City of Miami officially designated the structure historic. A second designation, in 1987, amended the original to include the interior and an adjacent lot. But what really draws attention to Villa Paula is its reputation as Miami’s most haunted home. 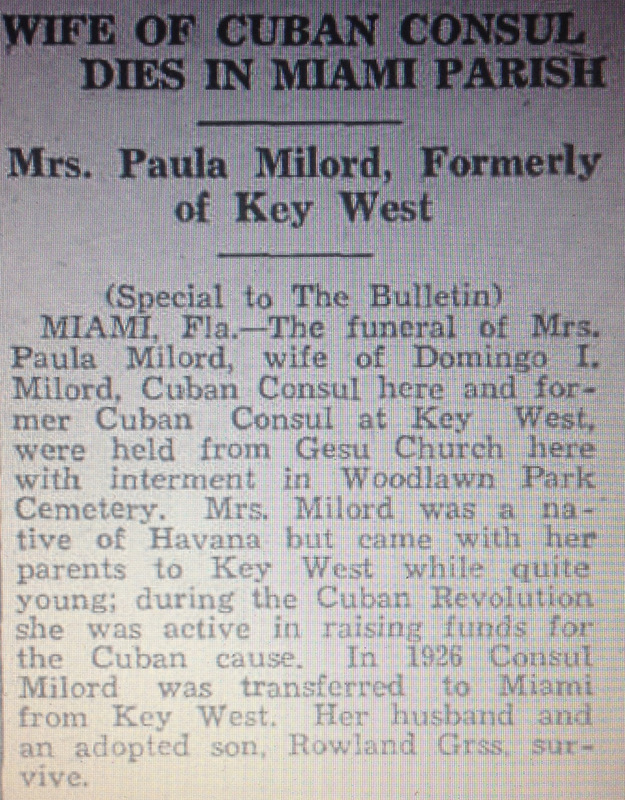 A few years after Cuban consul Domingo Milord moved into the newly constructed home, his wife Paula died in one of the bedrooms from complications related to a leg amputation (See Footnote). The circumstances of the amputation and of her premature death are unclear. We know, however, that despite the effort put into construction, Villa Paula ceased to serve in an official capacity for the Cuban government sometime after Paula’s death. Ensor ascribes the consulate’s closing to “the troubles in Cuba,” and indeed there was trouble. President Gerardo Machado, faced in the early 1930s with growing opposition, including a burgeoning Communist movement, morphed from democratic reformer to repressive despot. Following a series of violent clashes with opponents, he resigned. Then, in quick succession, three different national leaders came and went, ending with the ascension of military strongman Fulgencio Batista. Some of Villa Paula’s hand-painted floor tiles. Back in Miami, Villa Paula was shuttered and sold to one Muriel Reardon, who lived there for around 30 years until her death in 1960. Villa Paula continued to change hands during the next 14 years, even serving as a senior citizens’ home for a period of time. By the 1970s, abandoned and derelict, Villa Paula was near literal collapse, and fortuitously ended up in the hands of Ensor. He says he and a few friends immediately set to work on the place — cleaning, painting, removing graffiti, landscaping, fixing broken windows, restoring the interior, eventually returning Villa Paula to a condition close to its former glory. A hallway with columned grand arch and chandeliers. However, it is also with Ensor that the strange tales began. He began relating stories of a black-haired woman who would float down the hallways in a long gown, with only one visible leg. He claimed he would often smell coffee brewing and the scent of roses when there were none. He said he heard piano music, and high heels on the back porch. His dishes and silverware, he claimed, were thrown to the floor one day and a chandelier inexplicably fell from the ceiling. A back gate would slam shut on windless days and kill Ensor’s cats — three of them in total. Ensor invited mystics and held séances in the house. Rev. Emma Tandarich, a visiting psychic, claimed five separate spirits haunted the house, including a young woman searching for the grave of her illegitimate baby — perhaps a servant who had lived in the house. The unsettling tales, plus the publicity Villa Paula received during the 1980s (notably a cover story in the Miami Herald‘s Tropic magazine), spooked local Haitians. Many would bless themselves and cross the street to avoid walking in front of the house. Ensor spent years trying to sell the place, asking $185,000. He eventually resorted to auctioning it in 1985 for $110,000. Postal worker Larry Cozart, who won the auction, immediately backed out of the deal when he learned of the haunting. Ensor managed to sell the house two years later to Lucien Albert, a Haitian pediatrician skeptical of the supernatural claims. When contacted by telephone in March of this year, Dr. Albert, who sold Villa Paula in 2003 and now lives in Kendall, had no opinion to share on the matter. He suggested BT call the current owners. “They can tell you what you need to know,” he said. 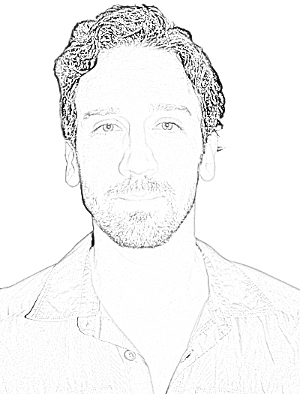 Garcia would often hear thumping on the wooden ramp that leads up to the back door, as if someone were walking on it. The day after he brought his cat to the house, she disappeared. “I didn’t find it dead. I just never found her at all,” he recounts. A friend of Garcia, apparently sensitive to the spirit world, began to cry after entering the former maid’s quarter. “They used to beat the maid,” the friend told him. The daughters of previous owner Reardon, who lived in the house prior to Ensor, sent him a letter from Alaska when they learned of his experiences. “When we were little,” they wrote, “there was one room that we were never allowed into.” Their mother, it turns out, was terrified of that room. Read the original Biscayne Times article. * Updated (July, 2015): Google’s News Archive has since revealed that Paula did not die in the house but, rather, at a local hospital. Also, recent reports claiming that Paula is buried in the backyard are false. This archival news clip says she was interred at Woodlawn Park Cemetery.